Illustration of ion escape from Mars. As on Earth, solar ultraviolet radiation separates electrons from the atoms and molecules (blue particles), creating a region of electrically charged – ionised – gas: the ionosphere. This ionised layer interacts directly with the solar wind and its magnetic field to create an induced magnetosphere, which acts to slow and divert the solar wind particles around the planet. In a new Mars Express study the ionising nature of the Sun's radiation is found to produce more ions than can be removed by the solar wind. Although the increased ion production helps to shield the lower atmosphere from the energy carried by the solar wind, the heating of the electrons appears to be sufficient to drag along ions under all conditions, creating a 'polar wind'. 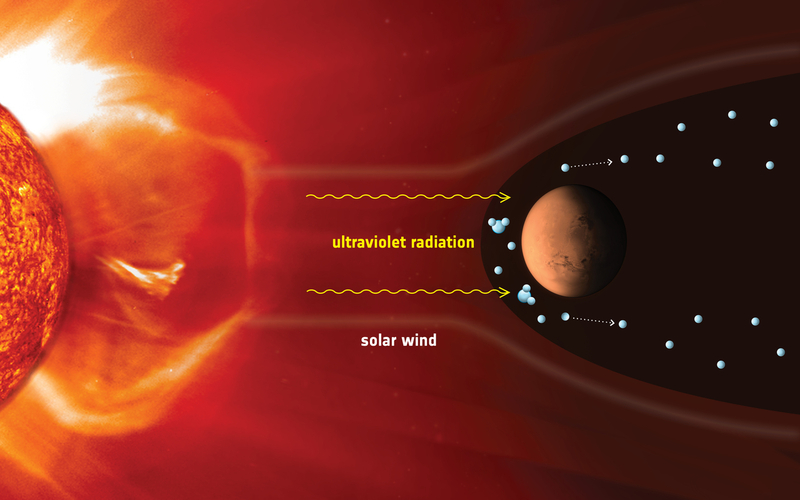 Mars' weak gravity – about one third that of Earth's – means the planet cannot hold on to these ions and they readily escape into space, regardless of the extra energy supplied by a strong solar wind.